The union movement is gearing up for a possible federal election in 2018 under the banner of #changetherules. Inequality is at a 70-year high. The industrial relations laws of Australia grossly favour employers. Nowhere is this more obvious than in the right to strike. We take the right to strike for granted as a democratic right of employees, hard won through innumerable strikes through history. By contrast, a recent High Court decision describes the right to engage in protected industrial action as “a privilege” and refers to industrial action, under common law, as “generally unlawful”, a breach of contract. It is an orthodox interpretation of the Fair Work Act, and all the more reason for change to that legislation. The right to strike is also a “privilege” conferred unequally on employers and employees under current law. For over 200 days, the miners at the mine at Oaky North in Central Queensland have been locked out by their employer. A “lock out” is industrial action by an employer – the boss – in which the employees are prevented from going to work by, for instance, locking the gates. The employees – the workers – are unable to work and receive no pay. It is a tactic to starve employees out, to drive them to a situation where they have no choice but to take any terms the boss offers. 200 days locked out. 200 families without pay for 200 days. If teachers, or any employees for that matter, threaten to go on strike for a single day, one would anticipate that the sky will fall in or the sun rise in the west, such is the outcry. As I write, the outcry is about Sydney train drivers. The mechanisms of peace-keeping and compulsory dispute resolution are urgently brought to bear. Very rarely, in our experience, has more than a single day of strike action by employees been tolerated before peace is imposed, justly or not. Public interest, threats to the economy and threats to safety are all invoked to limit employee action. Not when it is employer action. The employer of the Oaky North miners is Glencore, by all accounts, except their own and the Minerals Council, an indifferent contributor to corporate taxation. But the Fair Work Commission, which has been involved in this dispute, can’t compel an employer to offer work . A one-day strike by employees is too long, 200 days by an employer is not enough. The rules are broken. The QTU has made two contributions to support the miners and their families: $10,000 before Christmas and $10,000 this year in the lead-up to students returning to school. I and a number of other members have contributed personally. I urge as many of you as possible to make a small contribution to support these Queensland workers locked out by their employer. There are numerous other issues with federal industrial relations law – underpayment of wages and non-payment of superannuation, workers in labour hire and franchises being paid incorrectly, casualisation of the workforce and the loss of security, employers like Murdoch Uni threatening to withdraw from EB agreements to instantly drop the pay of employees by 10, 20, 30 per cent. A fairer federal industrial relations system that properly recognises the rights of employees is not achievable under the Turnbull government. Corporate tax cuts are their business. On this as on education funding and a range of issues, changing the rules will mean changing the government. preparing for EB negotiations in both schools and TAFE in 2019. 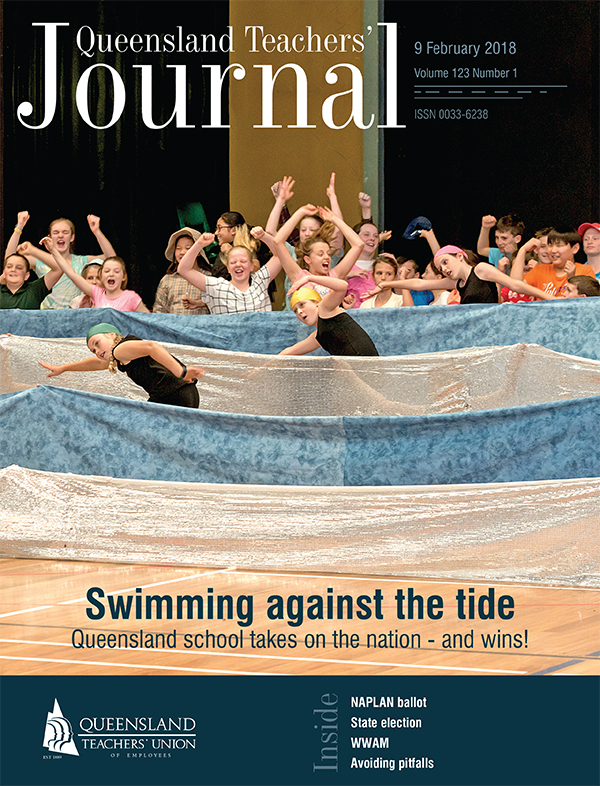 In all this, and whatever else comes our way, our aim is to be the democratic and representative voice of the teaching profession in Queensland.